On some days, I find myself quite disappointed that I finished my architecture degree. It was back in the day when there were design projects due and, my friends and I got only very little sleep. We were craving coffee at all times. The good thing though was that we had an immediate solution for that sleep deprivation called: “Kaffeefabrik”! 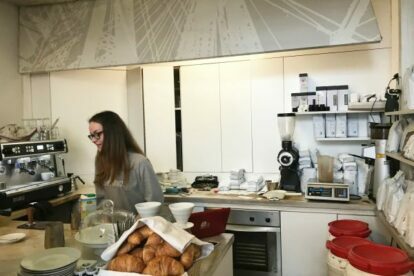 This tiny coffee shop is just a stone’s throw away from the technical university and Karlsplatz. Even today, years after I first set foot into this shop, I can still taste the very first sip I took of this ravishing beauty (beauty because of the latte art they do). It has truly brought my understanding of coffee to a new level. Usually they also offer sweets, like brownies, that vary daily. There is only limited seating capacity, but as spring is just around the corner, I would buy a takeaway coffee, bring it to the pulsating Karlsplatz pond (check out the article) and enjoy both the coffee as well as the arrival of a new season.